If you've been reading here for a while you may have noticed that I have a love for our home states and state shaped things. A big part of my about me section is that I am a Virginian currently residing in Indiana - and I'm damn proud to be from The Old Dominion! Zach was born in Michigan - and is damn proud of it too - so it is important to me to keep close the memories and things associated with where we come from. We are both proud of our states, and I'm super proud to call the south home! While others may be obsessed with monograms, I'm obsessed with state related things...seriously. You may remember this gift guide from before the holidays - but did you know that I got a Virginia shaped cutting board for Christmas and am on the hunt for a Michigan shaped one? Probably not! Do you remember ages ago when I tried to have my blog header feature both Michigan and Virginia? Probably not because after like a week or two I scratched the design..... Seriously, we love our home states! 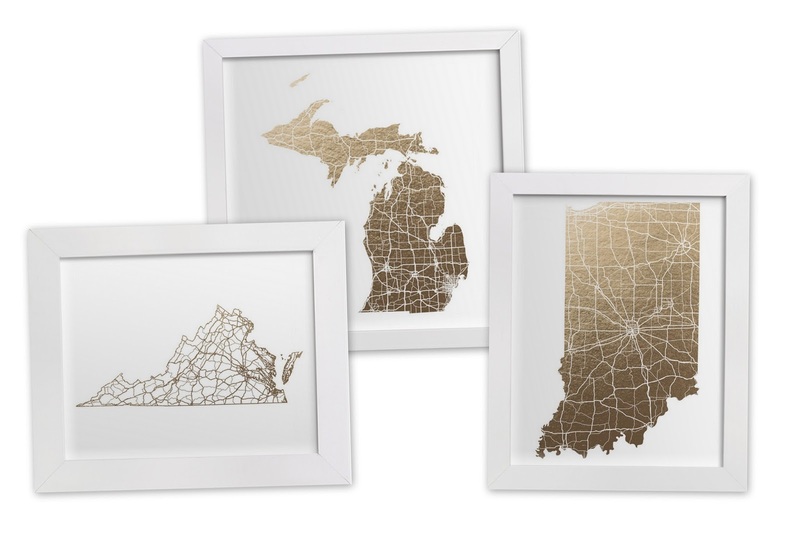 So if ever there is an option for custom state shaped art....I'm all over it. this post was created in partnership with Minted.com, please read my full disclosure here. 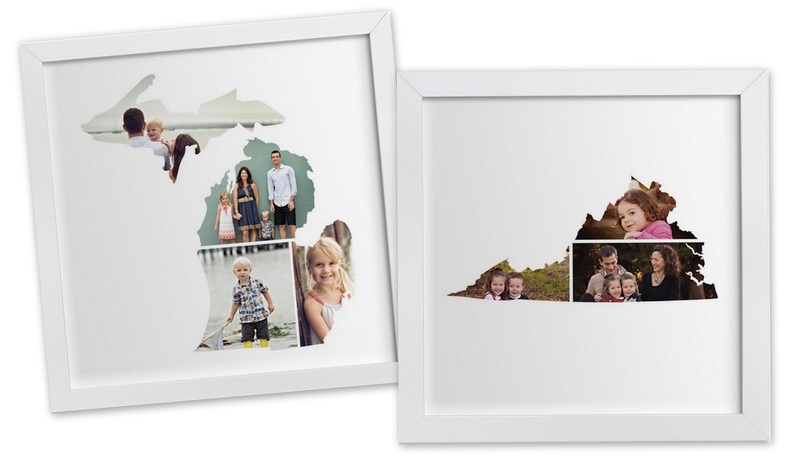 Recently, Minted contacted me to do a review on their Art Marketplace and I instantly fell for the Custom Sate Photo Art. Which reminds me, we need to get new family photos to include the dog! This is certainly a unique option that I have yet to see anywhere else online. I'm picturing a creative gallery wall of the small 8" x 8" prints with various photos from our trips to different states. And at $29 for the standard print - well that's an affordable way to build a custom gallery wall! I did play around a bit on the site and actually inserted some pictures into the Michigan state from our trip to the Coast Guard Festival a few years ago. That was one of my favorite little trips we ever took while we were at our little Michigan pit stop. It was fun to go to the beach and see all the ships! I am trying to make it a priority to travel more as a family (dog included) and these little collages would be the perfect, tangible way to remember some of our earlier trips. Memory keeping is becoming really important to me because I want to make sure there are tangible reminders of where we come from and where we've been. Not only do they have Custom State Photo Art but there are tons of art prints - too many to choose from in my opinion. However, if you've been digging on the gold foil trend recently they have quite a few to pick from and again, I'm digging the state shapes! There are maps, bridges, states, etc that would look great next to the photo collages. These little prints would be an awesome way to remember out travels, too. Additionally the size guide above is featured at the bottom of each print listing to give you an idea of scale. This is amazing because I am so bad at imagining sizes and how they would relate to other prints. For example, I think that 10" x 8" would make an amazing size but really, this map of the world print would make a statement at the 24" x 18" size, or bigger. Plus you could use it to track all the places you've been or like to go. Boy do I have travel on the brain. Overall I'm impressed with the Art Marketplace and with all the artists and designers featured! There truly is something for everyone on this site. Of course, if you're down for something different, Minted is know for their invitations and stationery. The Minted blog - Julep - is an amazing place for inspiration as well. I am so inspired by these prints and collages to see what I can do to keep our travel memories tangible and not just saved on a drive somewhere. How do you keep your travel memories tangible? Do you have insane state pride like I do? ps. This post was done in partner with Minted. I was compensated for my time with a Minted credit, however all opinions and thoughts are my own. Read my full disclosure policy here.